Fresh Halibut filets on a Sunday, a special treat from our most reliable Woodstock Market. Just the way we like it, one inch thick, with the fresh scent of the sea and plump to the touch. The freshly made Basil Pesto provided a delicious counterpart. And it made for an attractive plating. 1. Season the Halibut, add a splash of EVOO & Lemon Juice. 2. Heat the oven to 400 degrees F.
3. Heat a well-seasoned cast iron pan to high. Add the EVOO & Butter. Add the Halibut, skin side down & cook for 4 minutes. Remove to the oven for 4 more minutes. 4. Place the Halibut on a warm plate & cover with foil, while you finish the pan sauce. 5. Over medium heat, add an additional pat of Butter another splash of EVOO & a squirt of Lemon Juice. Loosen the pan contents together with the EVOO & Butter & mix to emulsify. 6. 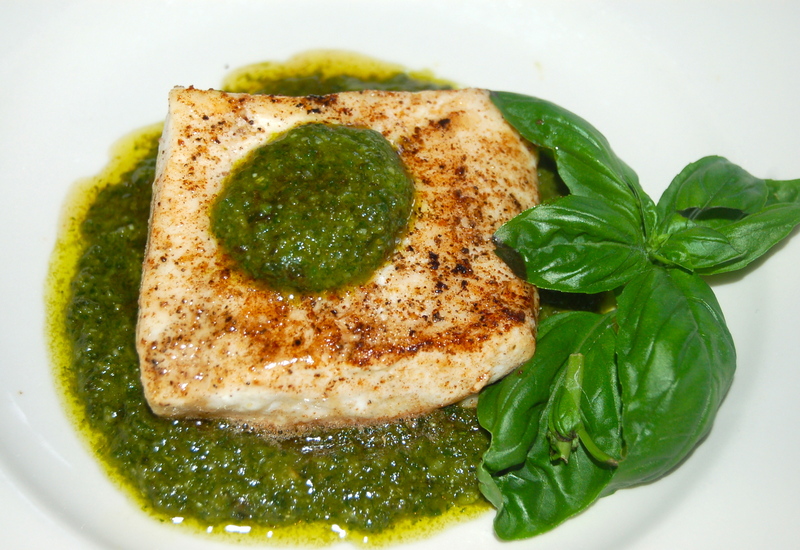 To plate, spoon a bed of the Basil Pesto & top with a slice of Halibut. Add a tsp of pan sauce atop the fish & a dollop more of Pesto. Garnish with a sprig of Basil. 2. Add the Garlic, Nuts, Parmesan Cheese, Salt & Pepper & process until very smooth. With the processor running, begin to add the 1/2 cup of EVOO into the tube-like-funnel on the lid of processor. When the Pesto has attained the proper consistency, it’s ready. 3. Transfer to a container, top with a thin layer of EVOO. It will keep in the fridge for a week, in the freezer for 6 months (though I highly doubt it will make it that long).